BeeTV - Watch movies & tv shows for free on Android device, Amazon Fire Stick, Fire TV, Nvidia Shield, etc. BeeTV - Watch movies & tv shows for free on Android device, Amazon Fire Stick, Fire TV, Nvidia Shield, etc. BeeTV is a modular search tool for content. 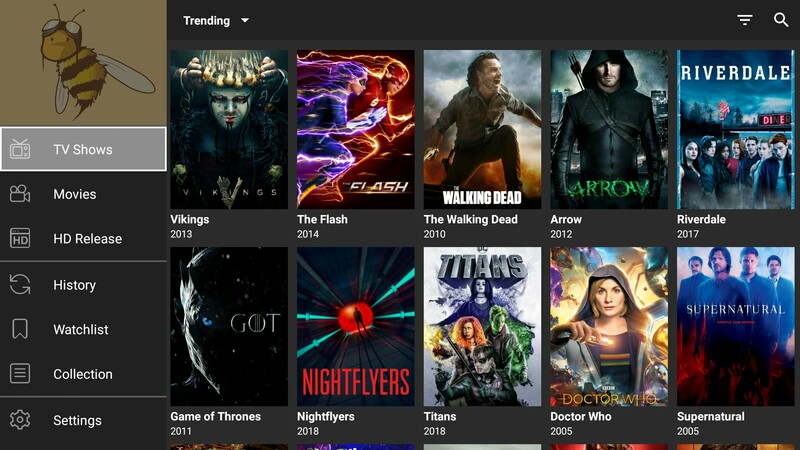 It crawls movie/tv shows hosting websites and can find and return the videos hosted on those sites.For example, BeeTV can find Avengers: Infinity War, or complete The Walking Dead seasons, all using the Modules built by the amazing members of our community. - Fix auto play feature. - Add 10 link providers. - Optimize UI on TV. - Add Editors' Choice section. - Fix bug crash on some devices. - Add clock and off subtitle feature on internal player. - Optimize code for faster link resolve. - Add direct/cdn link providers. - Fix trailer on Nvidia Shield. - Fix trailer on Firestick, FireTV, Nvidia Shield and other Android boxes. - Add feature to backup and restore watchlist, watched history. - Add feature to auto backup before updating. - Add feature to auto play next episode. You can choose number of link to auto play. Really need feedback from you to improve apps. Merry Christmas! - Add feature to change poster size. - Add feature to choose default movie and tv show category. - Add category latest, now playing, popular, top rated, upcoming for movies. - Add category airing today, popular, top rated for tv shows. - Add feature to hide unaired season and episode. - Add feature to mark watched movie, can sync with trakt. - Add feature to download watched history from Trakt in setting. - Add feature to mark episode as watched. - Add sort A-->Z on watchlist and collection. - Add trailer in movies/tv shows. - Add ability to choose default tab. - Give MX Player Pro priority when choosing MX Player in setting- Add year of movies/tv shows on search suggestion. Yes, there are no subscription fees. Does BeeTV host copyrighted videos? No. BeeTV is a media search tool. It does not host any copyrighted videos on its servers. The maker of BeeTV does not condone the streaming of copyrighted content and intends that this tool be strictly used for searching open license or public domain movies and shows. The maker of BeeTV takes no responsibility for how BeeTV is used, and BeeTV does not remotely track or store any information regarding the browsing/streaming activity of its users. BeeTV has no control over what media is put up or taken down. It merely scrapes 3rd-party websites that are publicly accessible via any regular web browser. It is the responsibility of the user to avoid any actions that might violate the laws governing his/her locality. Modules are "addons" to BeeTV that users can install to find the content they want or to customize their experience. BeeTV modules are still in development, but eventually the module system will be opened up to all 3rd party developers. You can check out the currently available modules in Settings > Modules to get a taste of how they work. The goal is to expand on the types of media BeeTV can play as well as the protocols they can be played on. In combination with 3rd party modules, we should see some really interesting things in the future. Where can I find news and info about the development of BeeTV? You can subscribe to fb/beetvmovies for continued updates on the development progress. It's also a great place to look for answers to any problems you might encounter. BeeTV can't find sources for ANYTHING! Wtf!!??? Most likely your ISP is blocking certain modules. You can also try installing additional modules inside the app, or try using it with a VPN. Is there an Other Operating System available? As of now BeeTV is working with any Android devices. There are plans to expand to another OS as well.